Rockingham County - George Washington N. F.
Rockingham County - George Washington N.F. 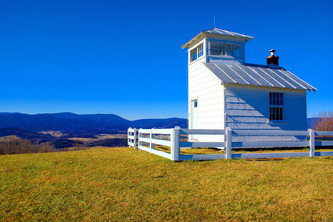 January 2003: The lookout tower was sold at auction with removal required. October 28, 1952: "Nearly 250 volunteers fought a futile battle against a forest fire near Covington last night, and 150 more men were dispatched to the scene early today as the flames leaped over the fire lines. U.S. Forester Charles R. Switzer said the flames, covering almost 700 acres this morning, broke out about 15 miles from Covington, on Potts Creek road, and destroyed the Morning Knob fire tower before they could be checked. October 12, 1961: "A 110-foot fire tower erected in the Partlow section of Spotsylvania County is expected to nearly erase a blind spot in the area's fire spotting system. The tower was put up this week by 13 staff members from various locations in the Virginia Forestry Division. The system also includes an 80-foot tower near Shady Grove Church in Spotsylvania and other towers in Orange, Louisa and Caroline County. Dallas G. Wifong, district forester, who supervised erection of the tower, said coverage had been inadequate in the sprawling woodlands extending 10 to 15 miles around Partlow. Now visibility will extend about 20 miles in all directions in clear weather. The new Spotsylvania tower was transferred here from Prince William County Forest Park where it had been located since early in World War II. After the war, the tower was not manned. Erection of the tower on the property of Lewis Jones at Partlow was done speedily by the forestry workers. The most difficult task, that of raising an aluminum roof to the tip of the tower, went smoothly and was completed yesterday in less than 15 minutes. The roof was raised by means of a pulley, ropes attached to trucks and men guiding its upward ride. November 8, 1944: "Three juveniles were arraigned in trial justice court on a charge of breaking into and damaging the fire lookout tower on Peak knob, recently. Judge John W.B. Deeds sentenced one boy, 15 years of age, to two years in the reform school, and the other two were offered suspended sentences, provided they would attend school. One youth accepted, the other boy expressed a preference for the reformatory. District Forester G.H. Hodge, of Salem, Chief Forest Warden Joe Graham, of Pulaski county, and Deputy Sheriff Andrew Smith, of Pulaski, investigated the damage. They found property destroyed and much damage to the lookout tower. Smith took finger prints of the culprits, and with the evidence collected by the help of the other men, the misdemeanor was traced to three boys. Some of them returned, however, to break windows before their case came into court. Besides the sentence for the boys, the parents paid for damage sustained by the state and county. March 3, 1946: "A mile long telephone line has been completed to the forest fire warden tower on Peak knob, Joe Tate, chief fire warden, announced yesterday. The line was placed on poles which replaced trees used in the past, Corbert Boone, assistant warden, helping with the work. 2005: The 100-foot McClintock-Marshall steel tower was auctioned on ebay and sold for $1,255.00. July 19, 1953: "Because of the unusually dry condition of timberlands in Prince George County, Chief Fire Warden P.T. Birdsong said last night the county's lookout tower near Disputanta will go into operation today. He said this is the first time since organization that the tower has been manned during the summer which normally is not the time for forest fires. Forest fires should be reported be reported to the tower operator by telephoning 416-J-3 or to any county or state police officer. May 4, 1937: "Forest Service towermen on duty in the Reddish Knob Fire Tower reported that 138 visitors registered at the lookout cabin during Saturday and Sunday. October 2016: The tower was dismantled, cataloged and stored for possible future restoration. November 28, 1949: "Left alone at home while his relatives attended church, a 72-year-old paralytic perished in a fire yesterday morning on the Mountain Valley road six miles north of here (Axton). The victim was William Pleasant Haley. The four-room frame cottage was destroyed by the blaze which is thought to have started from a faulty flue in the attic of the home, according to Henry County Sheriff Morton Prillaman. Mr. Haley, whom Prillaman said was paralyzed from the waist down, had been left seated in a chair. His remains were found in the ashes some six feet from the door. Shenandoah County - George Washington N. F.
> A great appreciation to Renick Proffitt for sharing his findings and photos of visits to current and former lookout sites.